“Can I make it?” is the same question asked by widows whether they’re worth more than a million dollars or considerably less. As a financial planner the role becomes that of being a decision partner, someone you can trust, while you get used to being alone (and that’s what it is, “getting used to”, it’s not “getting over” or “forgetting”), and wondering whether you can make it psychologically and financially. Establishing a new cash flow is one of the great needs for most widows. Working with you to figure that out as you slowly establish a new life. Maybe you can’t do that right away, but as you make changes in the way you live — we help determine what it’s going to cost you and where the money’s going to come from. The other big thing is re-establishing the investment portfolio. Providing guidance without pressure to remove the worry from financial decisions and giving you the confidence to move forward with your life. Working with widows has become some of the most rewarding work for me as a financial planner. To be able to see widows grow and change and become empowered makes me feel humbled. 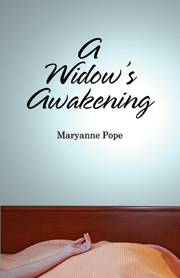 I am constantly looking for reassuring information on widows as I became a widow myself 3 months ago. I’ll keep reading your articles.